The first Bible my kids read themselves was The Beginner's Bible, which was a book that I did really like. Other than names, the words were basic enough for them, and the stories covered more than just the usual story-bible "greatest hits" type. 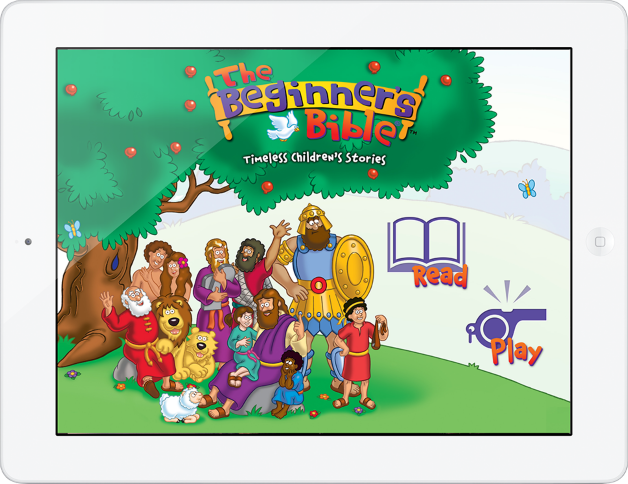 So learning that there is a The Beginner's Bible App? That got my attention. And the price for the first set of six stories, coloring pages, and a game? Free. That definitely got my attention. Additional sets will be $1.99. I downloaded the free app, and let Trina, my 6 year old, know there was something new on the iPad for her. She was easily able to work with it without any assistance from anyone. The "Read" section lets you choose a story, and the app reads the story from The Beginner Bible. The words are highlighted as they are read (a feature I really appreciate), and there is a bit of dramatization to it. In the first story, for instance, the title is read by a woman. Then the narrator (male) reads the story, with a few sound effects such as birds chirping as the narrator tells of God making the birds. Another male reads the portions where God speaks. Each page includes the text on one side, and a picture on the other side. The pictures have various "things" the child can do, such as making the butterfly fly across the page, or turning the picture from day to night. Many times, touching animals in the picture will cause them to make noises. The stories are very well done. The other section is "Play." This section includes coloring pages, puzzles, and a game. Coloring pages: three of the stories have coloring pages. You have the ability to choose your own colors (so you can have green sheep and a purple ark), OR you can click on one icon where it will color the picture "right" (to match the picture from the story) as you "color" with your finger on the screen. You can email your completed coloring page to someone as well. Puzzles: two of the stories have basic 9-piece jigsaw puzzle using one of the pictures from the story. The pieces can be dragged into place, and the app is not terribly picky about how exact you are in placing the piece. If you get it into roughly the right 1/9th of the board, it will slide into place. Love that feature for the little ones too. Game: one story includes a game. The game involves "popping" fruit as it rises up, and you need to get it before it falls back to the ground. If a piece of fruit falls back to the ground, you get an x. Three x's and the game ends. My 15 year old checked it out too, at my request. He's more familiar with iPad apps in general, and has even done some basic programming. His reaction was that this gets high marks for ease of use, and also noted that it works smoothly. He said it isn't something he wants to use himself, but that it is great for the preK-early elementary ages. He likes apps that his 1st and 3rd grade siblings can use without asking him for help. I like this app. A lot. I will seriously look at purchasing more sets of stories. You can download the free version of The Beginner's Bible App and see for yourself! Disclosure: Handlebar promised me a complimentary copy of The Beginner's Bible in exchange for a review of the app. No other compensation was received, and all opinions are my own. I chose to review this because I am impressed with the product. This would be perfect for my grandson! Thanks for posting this review Debra!